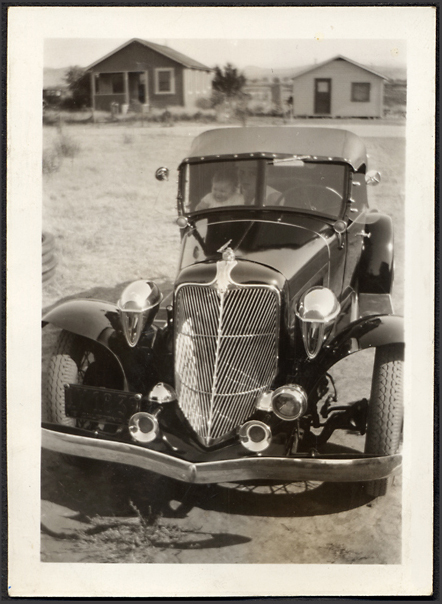 Mystery roadster w/ early 30s Chrysler grille modified to match Woodlites, somewhere in California. Photos were found more than ten years apart. 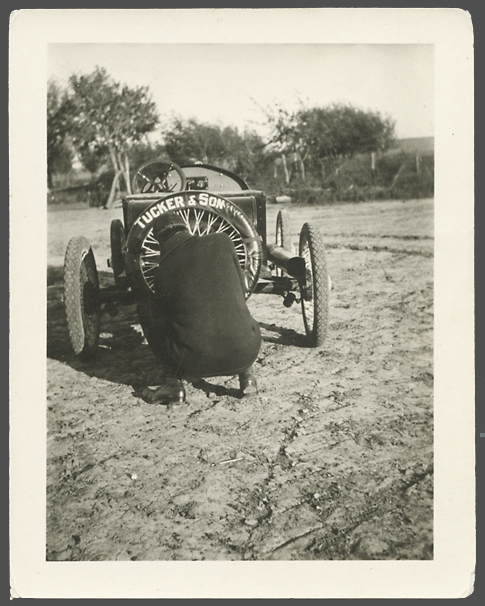 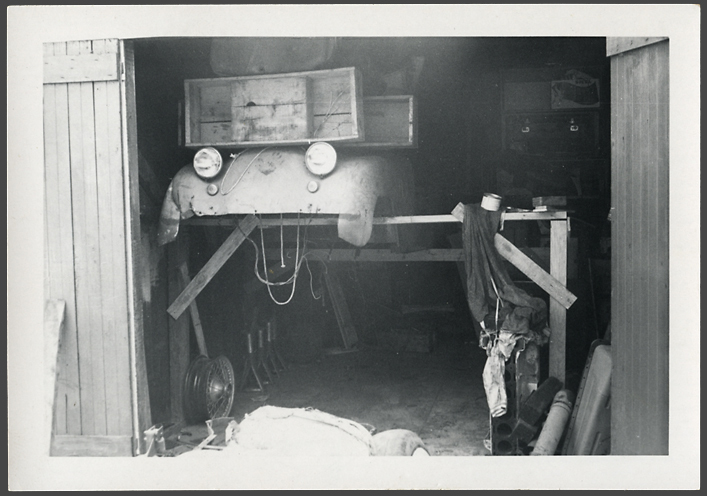 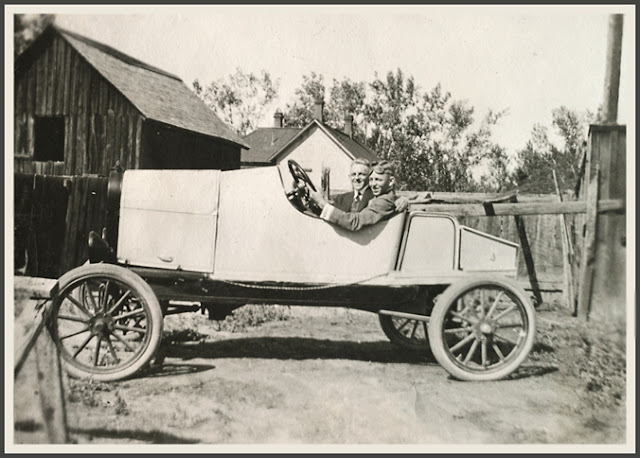 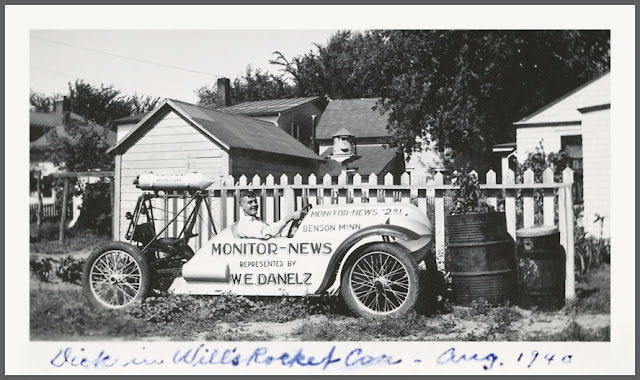 Rocket car used by Wilford E. Danelz (1909-1999) of Benson, Minnesota to help sell that city's Monitor-News. 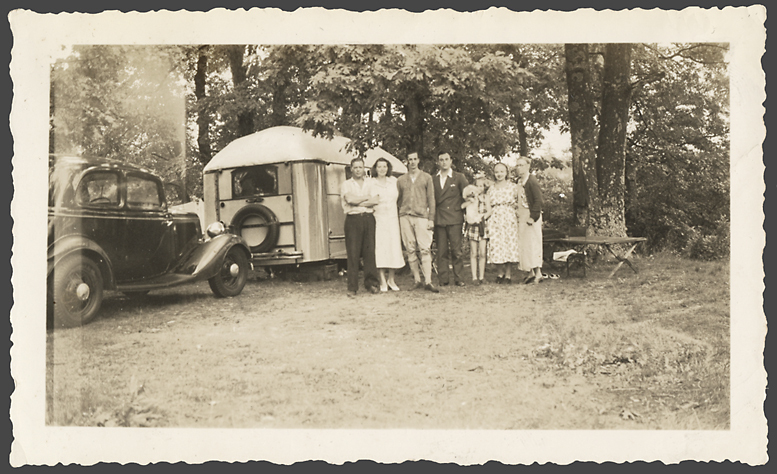 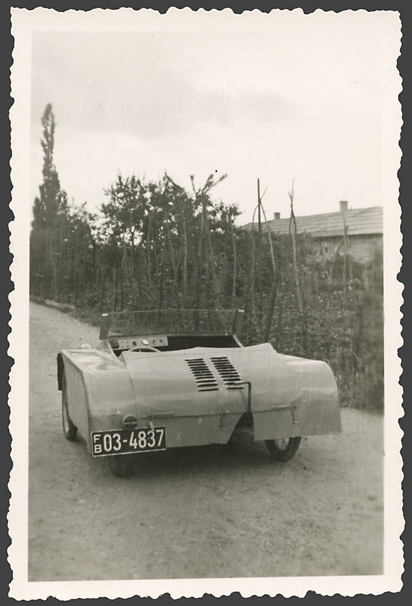 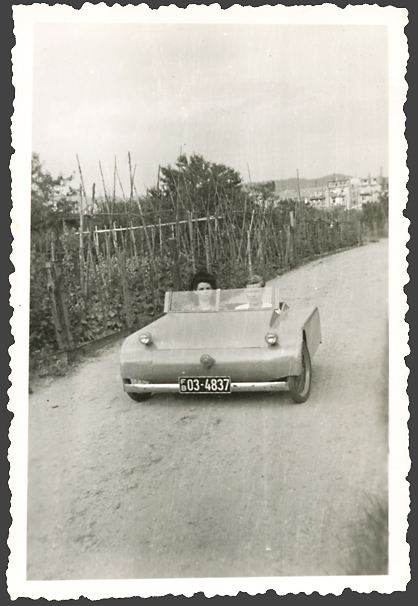 1949 De Franceschi micro-car born in Torrington, Connecticut, sharing field parking with Olds, Chevy, Jeep and Simca 8 Sports roadster. 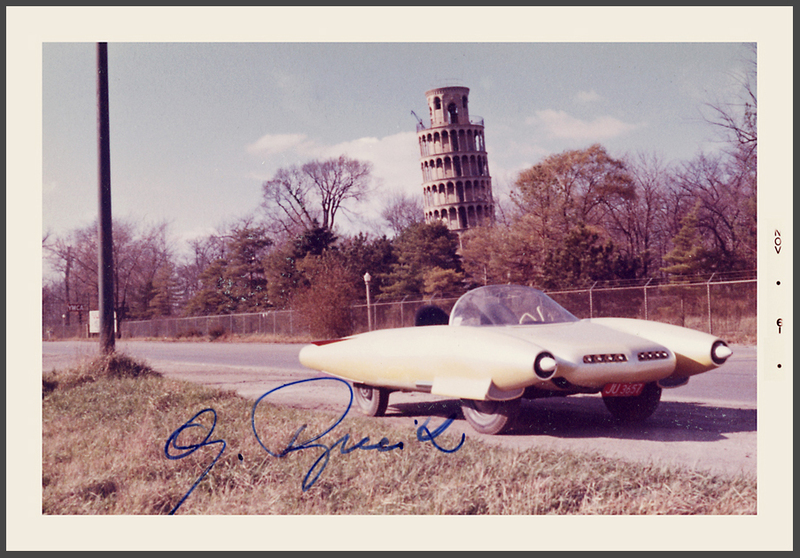 The Leaning Tower of Niles, Illinois was built in 1934 by industrialist Robert Ilg on the grounds of a recreation area for employees of the Ilg Hot Air Electric Ventilating Company of Chicago. The gold speedster in the foreground is an atom age enigma. 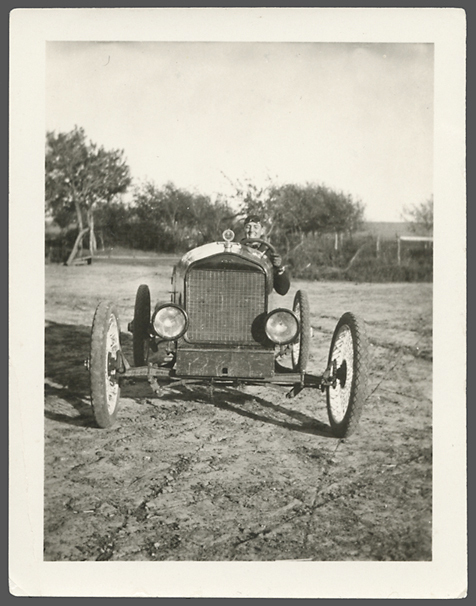 Modified Model T w/ Houk wire wheels. 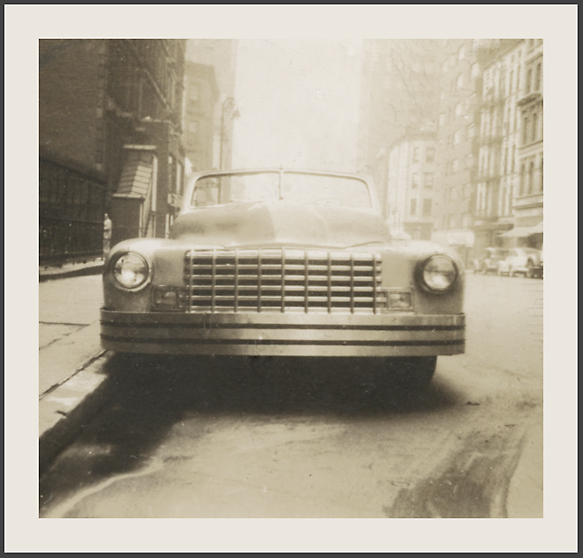 1942-8 Buick convertible w/ '46-8 Dodge teeth, possibly in Manhattan. 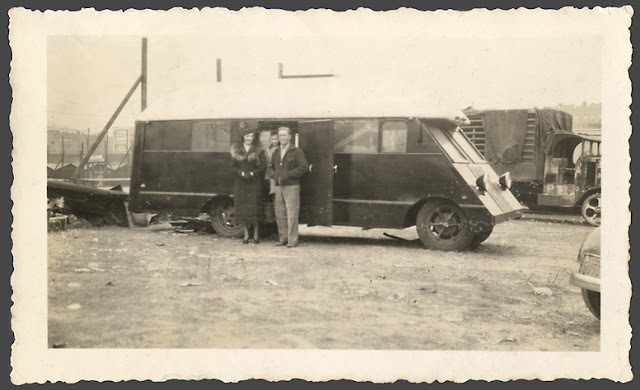 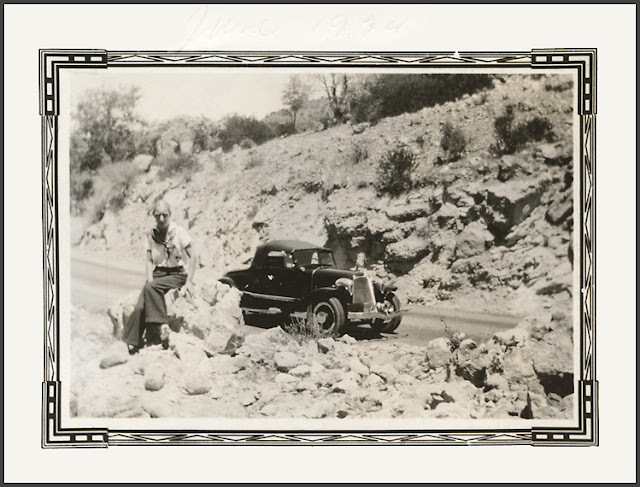 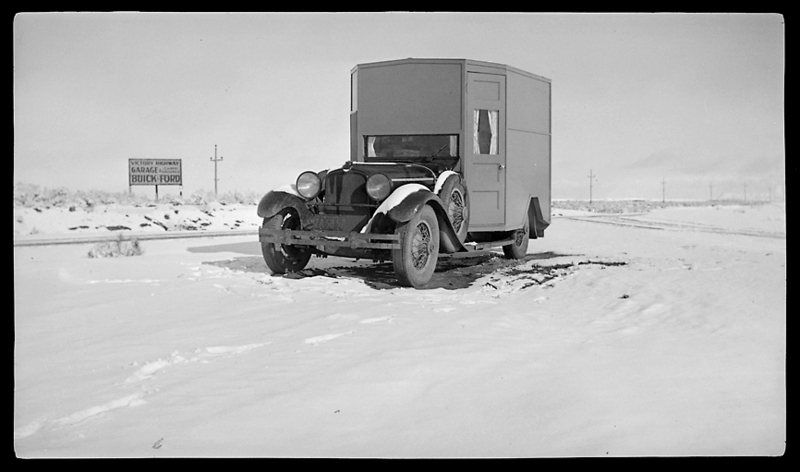 Circa 1927 Stutz w/ aerodynamic tweaks and fresh curtains, crossing the high desert on the Victory Highway. 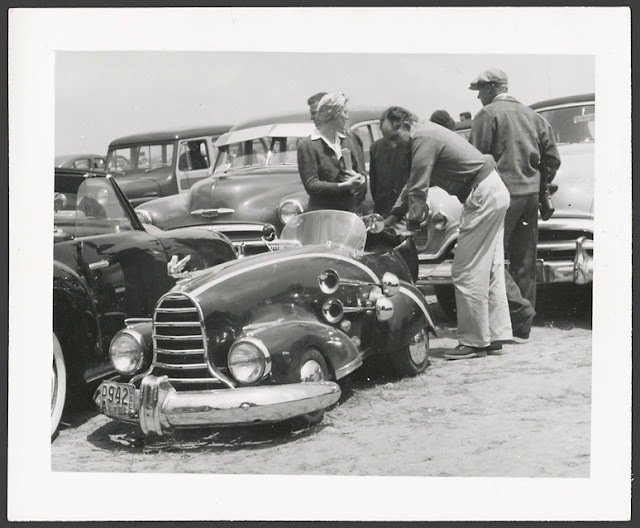 Kustomrama has more on the Honest Charley Speed Shop of Chattanooga, Tennessee and its mascots, with photos of a custom '34 Ford as well as a '39. 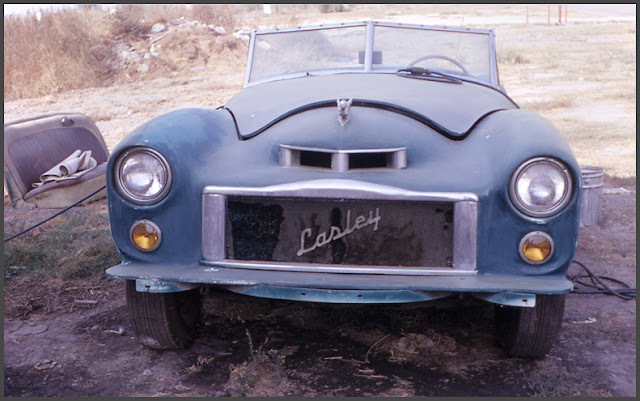 This looks like the latter with the former's front end. Crosley Hot Shot gives Southern California enthusiast with derelict Jag XK-120s a big idea. 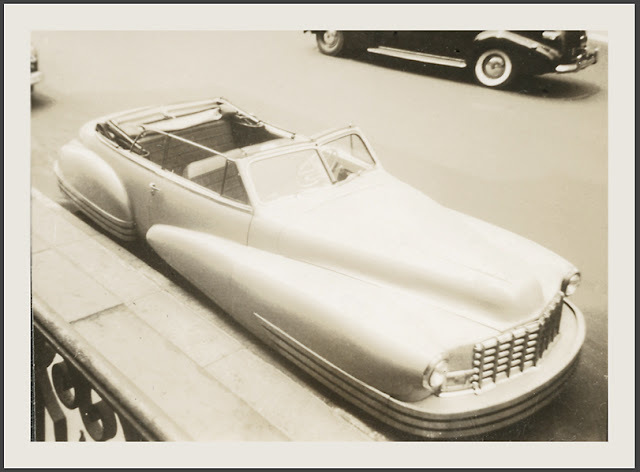 Possible Auburn Speedster shell on longer chassis w/ Cadillac nose and Packard wires, somewhere in sunny stylish California. Postwar sports roadster wearing another 1946-8 Dodge grille. I was recently contacted by the present owner, Christopher Lasley. 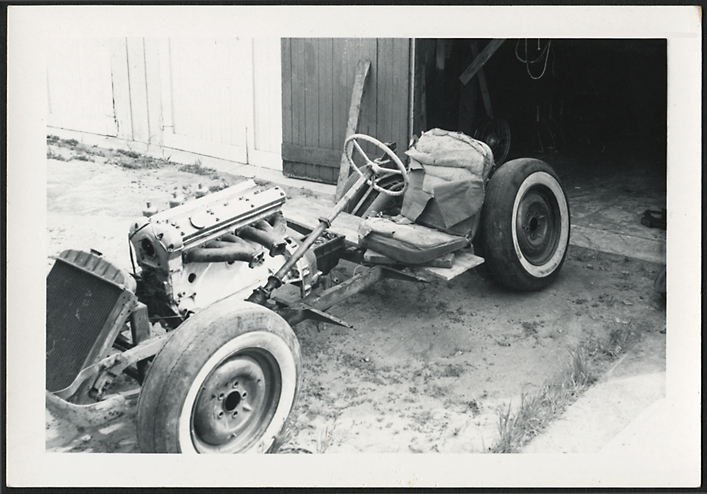 I am in the process of rebuilding the car now. 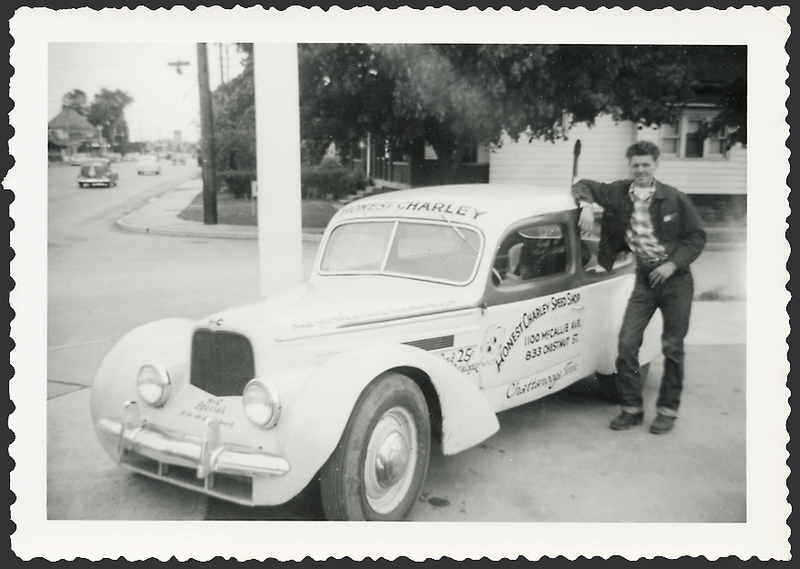 I have had the car for approximately 15 years. 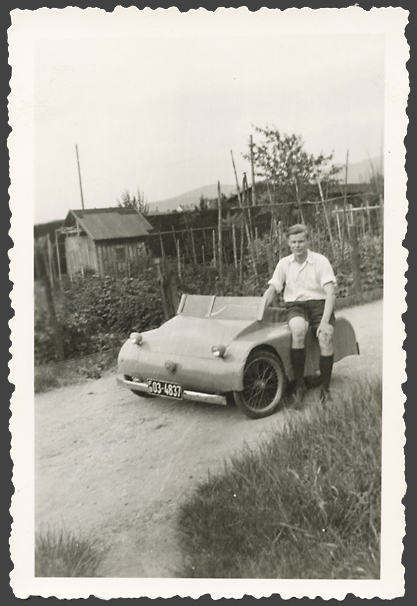 Before that my father had it and my grandfather before that. It was built in 1952 by my father and grandfather. The car has not been on the road in the last 35 or so years. 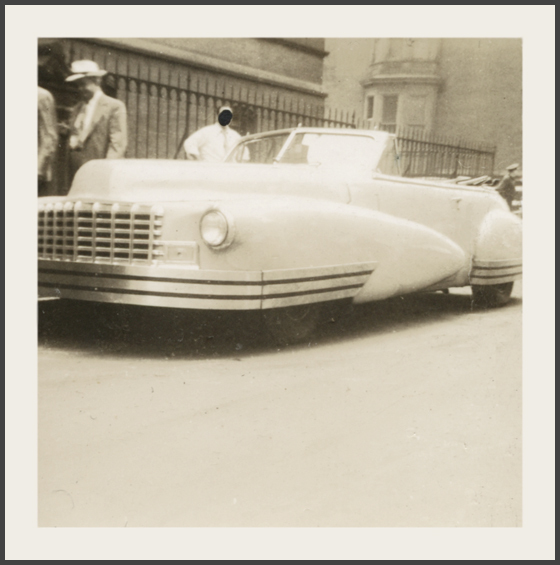 It is a one-off car. 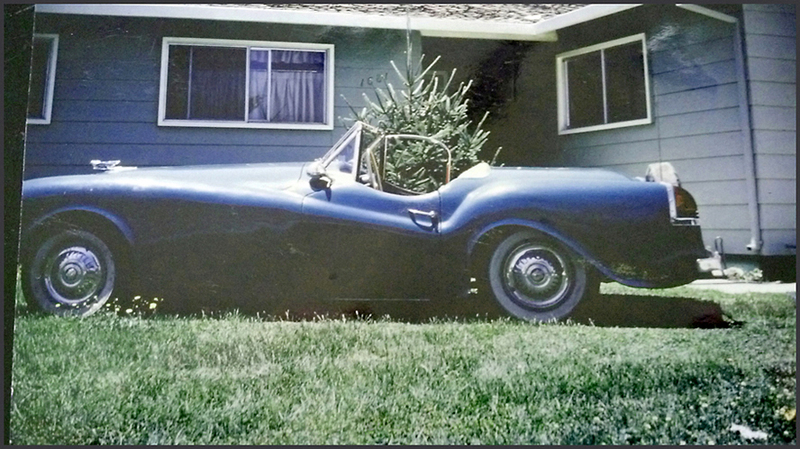 I'm hopefully going to have it on the road in the next few years. 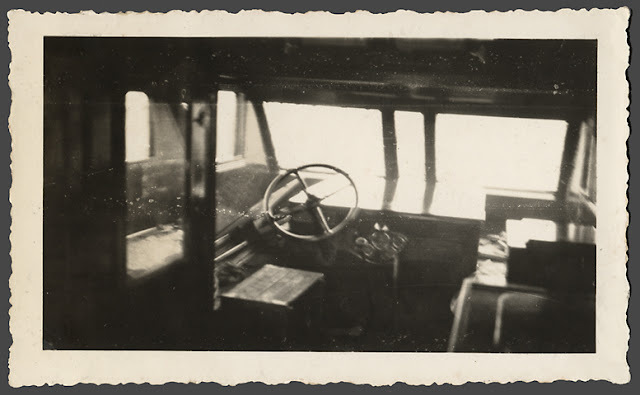 The photo you have was taken at Flabob Airport Riverside California in the 70's. 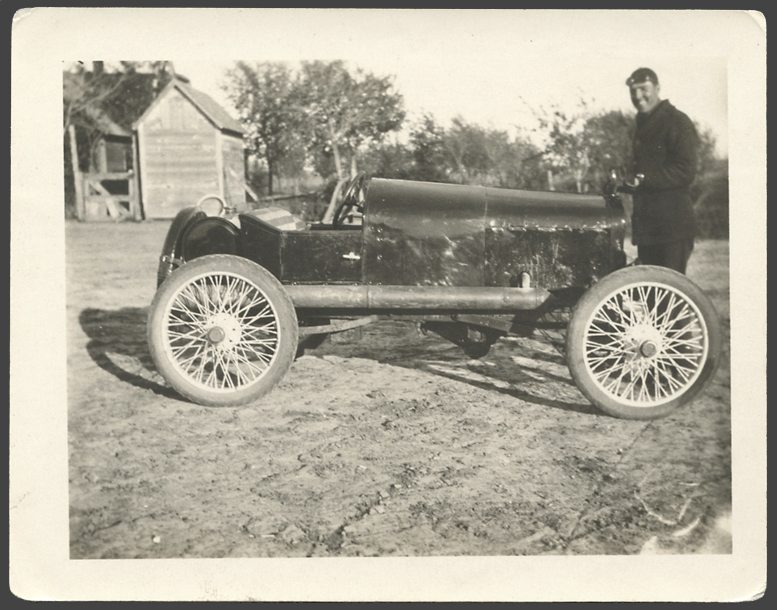 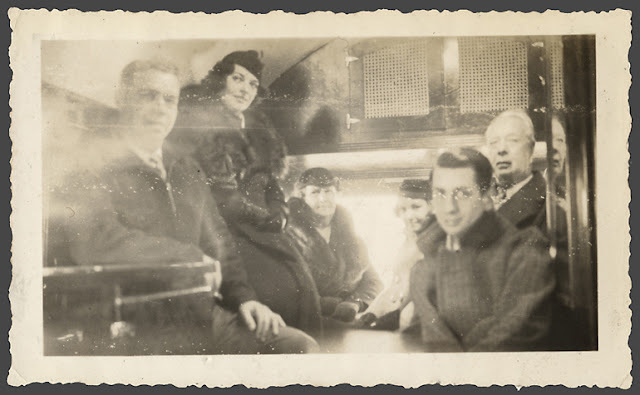 Grandfather John A. Lasley left Wisconsin for Southern California, where he worked as an aircraft engineer for Northrop. 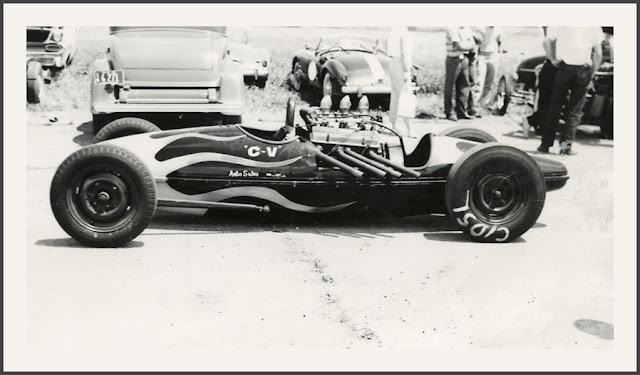 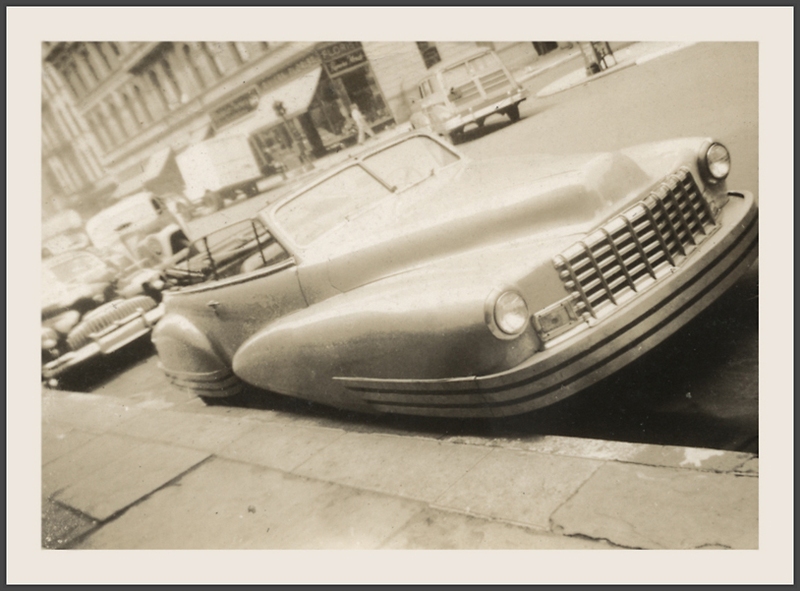 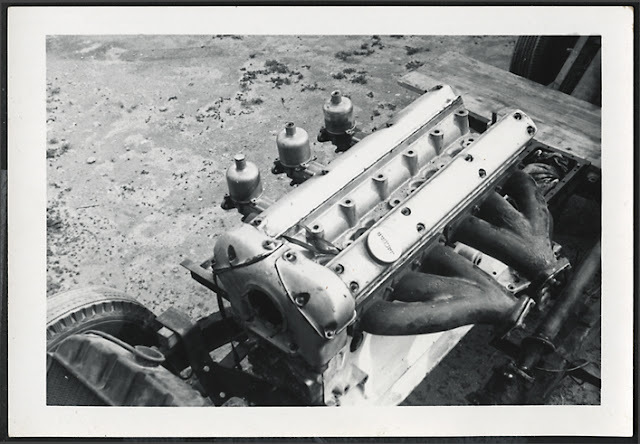 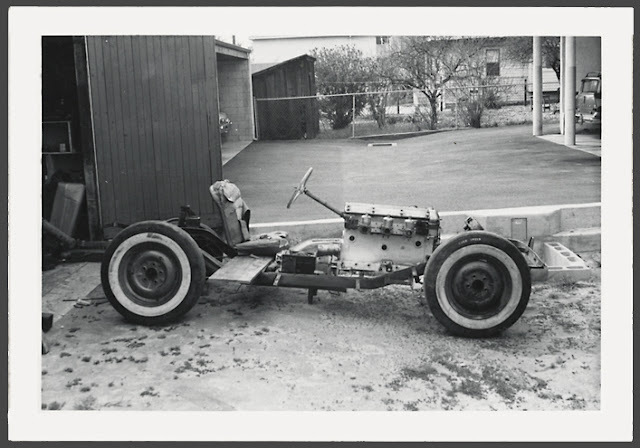 The chassis of the Lasley Sport, named after a much-modified biplane he used as a testbed in the 1930's, featured a '38 Packard front end and '52 Lincoln rear with Studebaker in between, powered by a '49 Caddy 331 OHV V8. 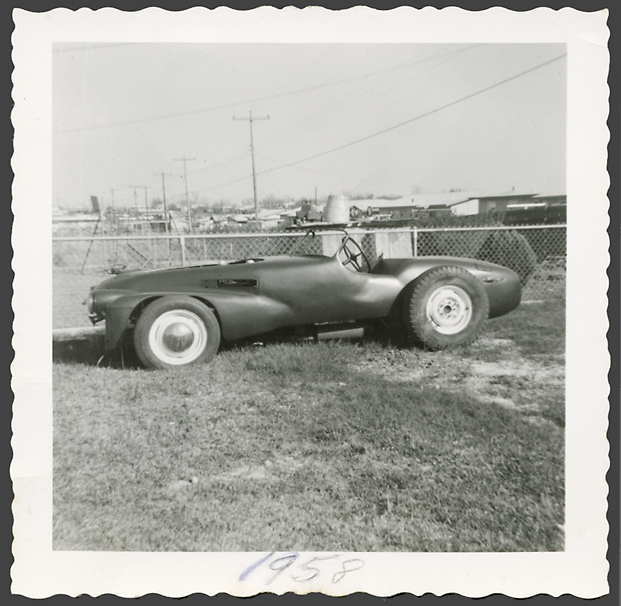 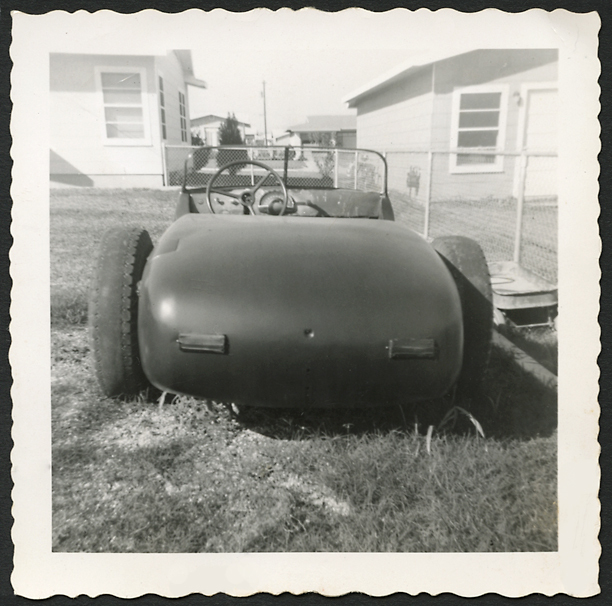 John A. made the molds for the fiberglass roadster shell himself. 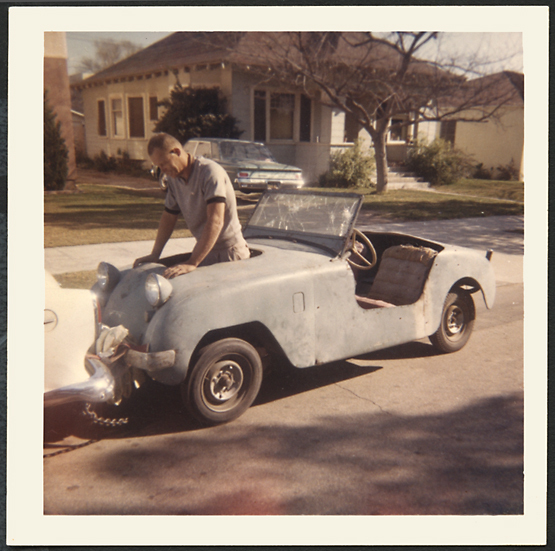 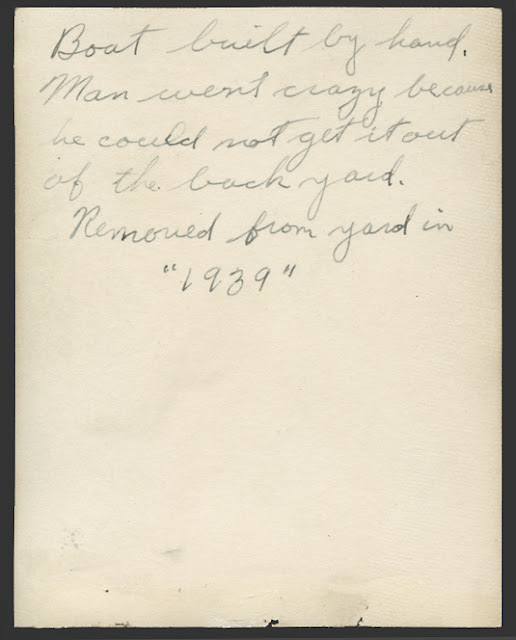 These days, Christopher plans to refurbish and modernize the car as a carefree cruiser he can pass on to his son, with a Mustang II front end and big block Chevy. 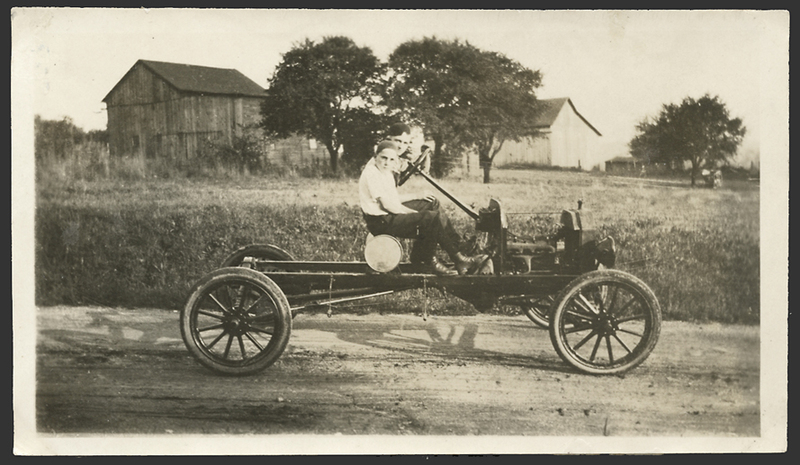 I encouraged him to hold onto the original bits, just in case. 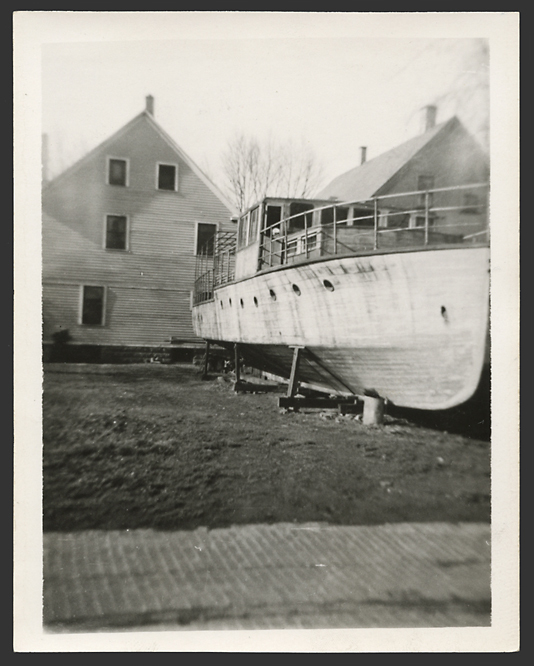 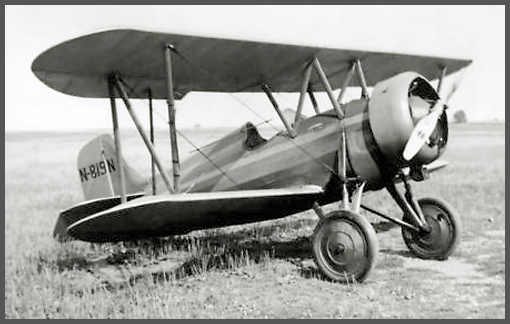 Sport 1931 = 1pOB; Velie M-5, later 90hp Lambert and 65hp Continental; span: 20'0" length: 18'0" load: 300# v: 110/100/45 range: 300 ceiling (est): 11,000'. [N819N] is one of the original Roza creations of the early '30s. 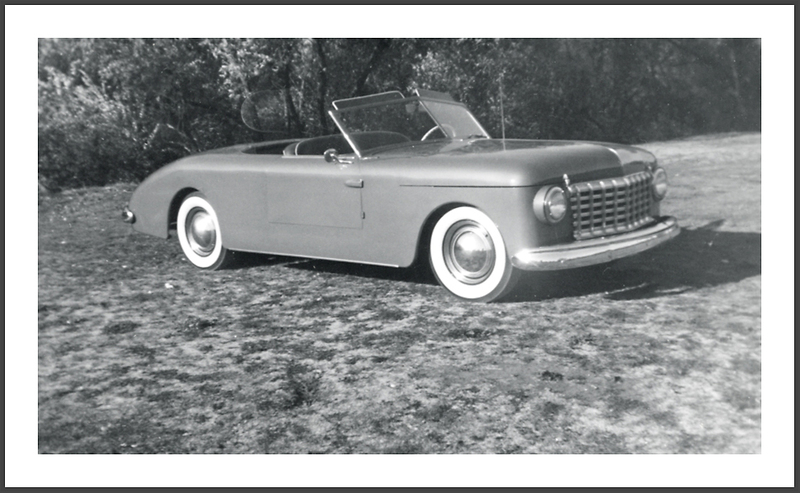 It was acquired by Franklin Aircraft Co., who modified it as a prototype for their Sport 90. 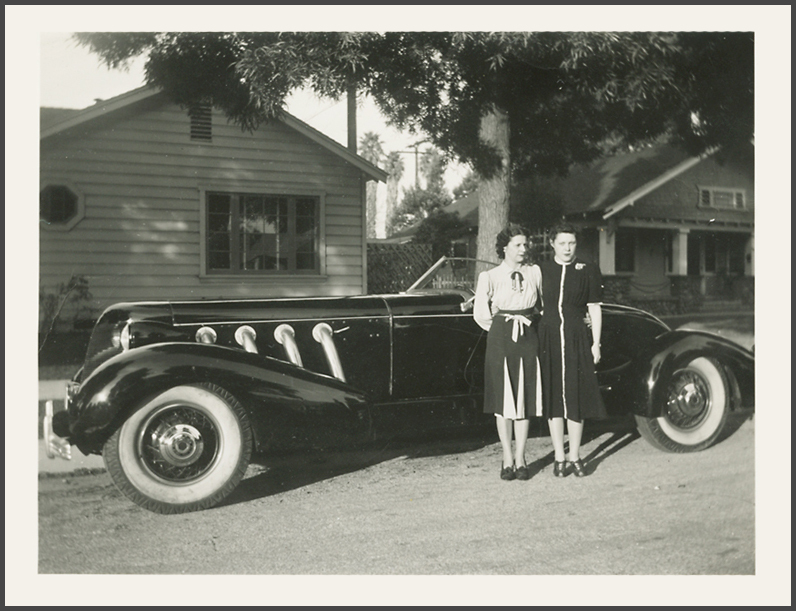 Purchased by Lasley c.1935, who built and installed Peyton Autry-designed wings, then sold it to Lloyd Gabriel. After a crash, it was rebuilt in 1953, reportedly with 125hp Continental, then crashed to destruction in 1957 while buzzing a house. 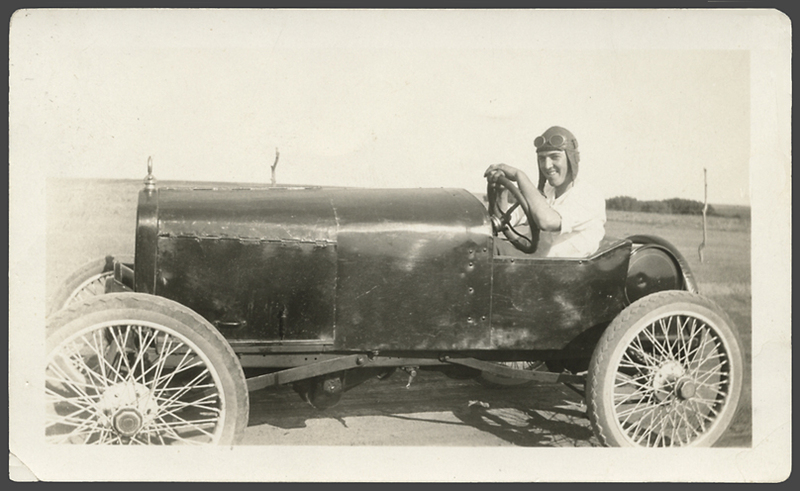 Lasley Sport biplane photo and text from Aerofiles. 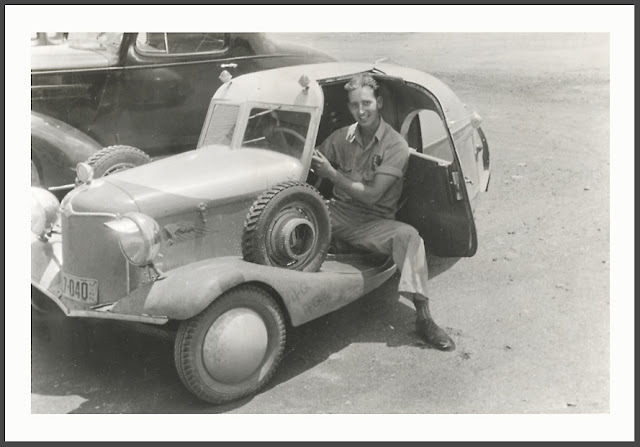 Built in the early 1930s by Minnesota teenager Bob Shotwell, this rear-engined tricycle coupe is powered by an inline four from a 1931 Indian motorcycle, with bodywork hand hammered from sheet steel at his dad's radiator shop. 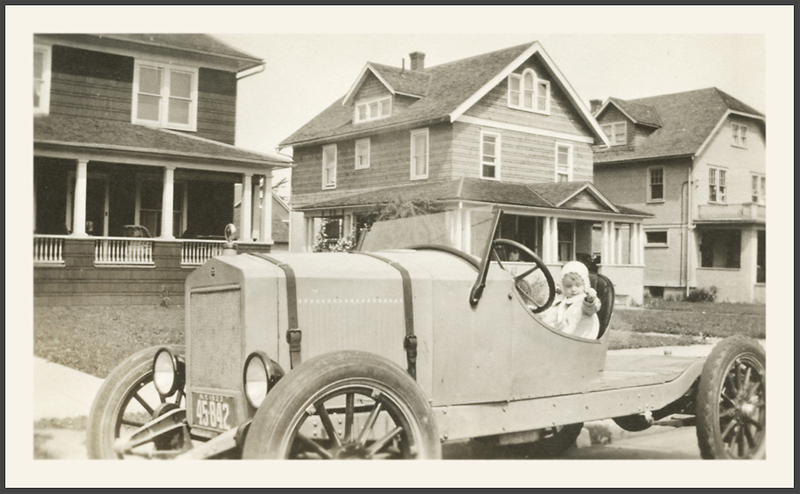 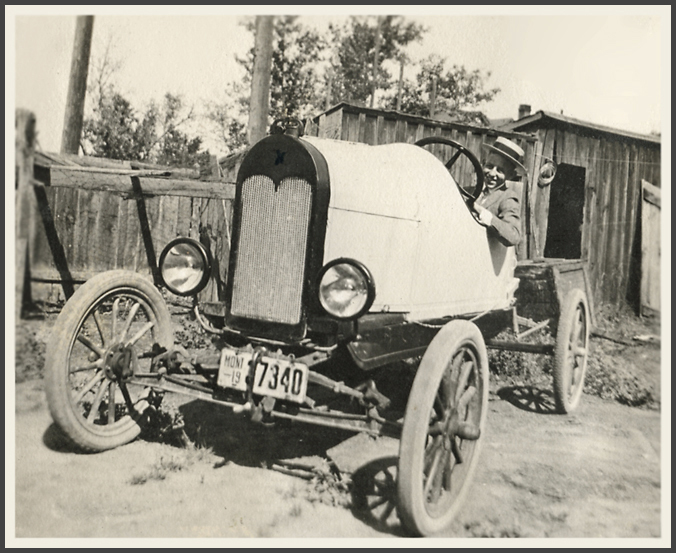 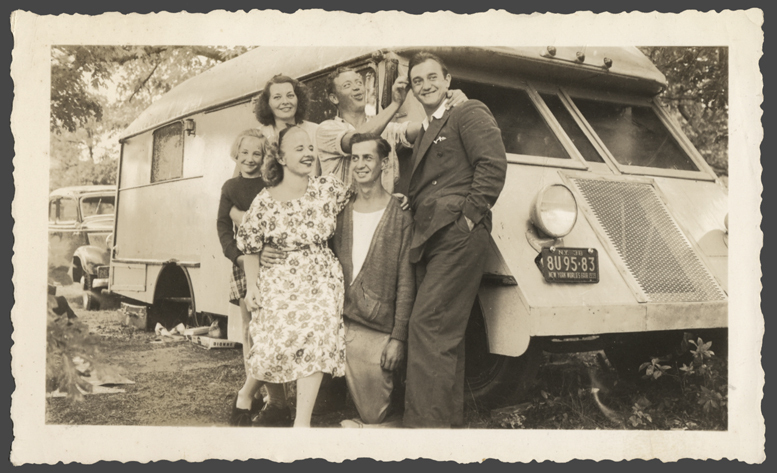 Bob and his brother Edward made local headlines with a 6000 mile grand tour, the car eventually racking up some 150,000 miles before its retirement. 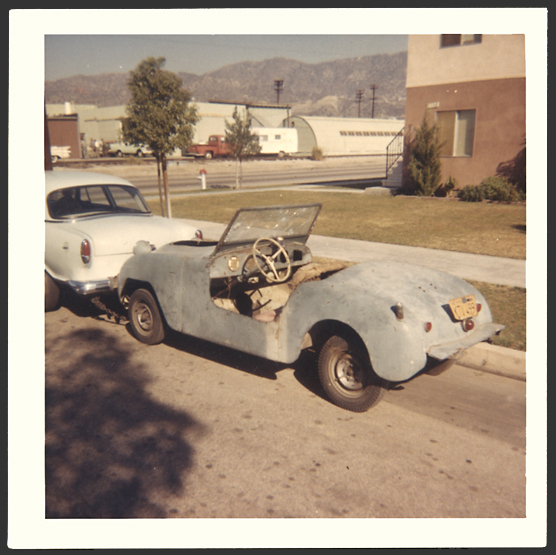 Fearing little Philbert would be plundered by bike restorers for its mill, Shotwell offered the car to Jay Leno, who restored it to a semblance of its former glory, minus the twin sidemounts and punk graffiti on the fender valance. 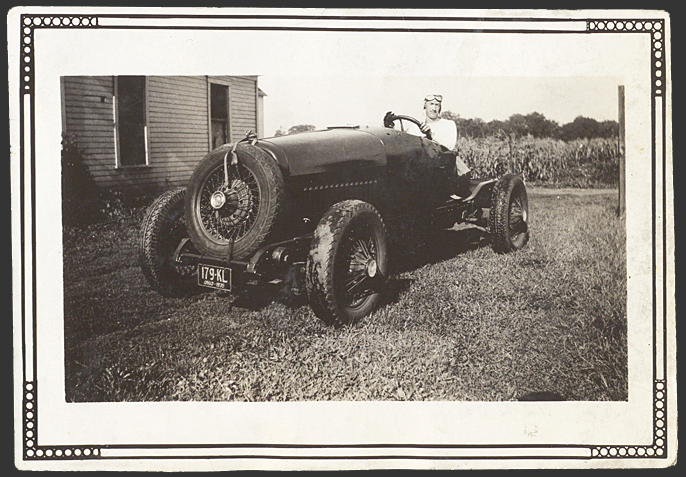 Buckeye State farmer behind the wheel of what I believe is a stripped down '23-4 Nash w/ wire wheels from a circa '28 Dodge Senior Six. Cornfield in background. 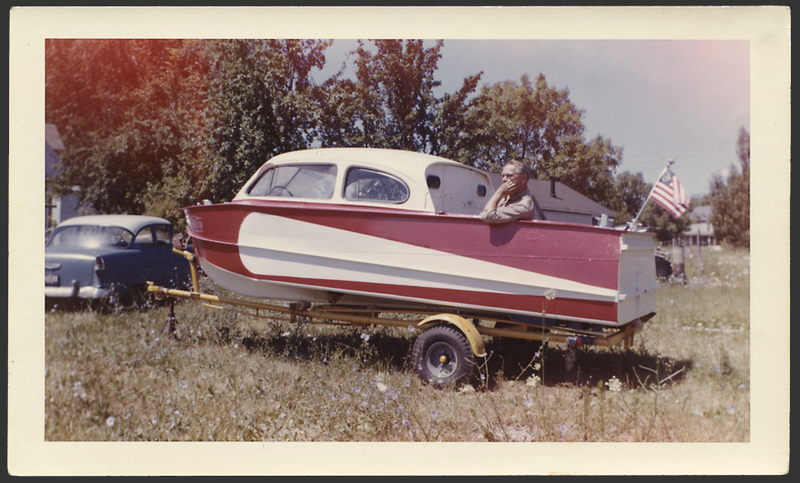 Phantom Turbo Jet from Hydra Marine of Loda, Illinois.